You might be wondering what I am talking about. Goals, Fights, and Bread at a hockey game? 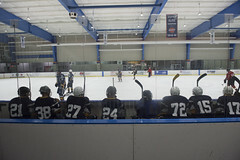 Yes we had all that at the Admirals home opener. All the goals came in the first period, most of the fights came in the third, and Sara Lee sent the fans home with a free loaf of bread at the end of the game. Now let’s hope Smithfield steps up and gives us some ham Saturday night so we can make sandwiches. 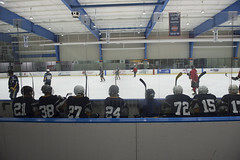 The Admirals played their third game of the new season, but this was the first one at home. Binghamton made their first visit to Scope of the season and it wasn’t exactly pretty . The Senators were shut out in a 5-0 loss to the Admirals. Alex Grant made his home debut in a Norfolk Admiral jersey and threw in a hat trick while Frederik Andersen stood tall in the net turning away every shot he faced. The second period was a much tighter game. The Senators replaced Hammond in goal with Nathan Lawson. Lawson would hold the Admirals offense scoreless for the period. Binghamton could not form any offensive threat and could not put anything past Anderson in the Norfolk net. The second period ended with the Admirals still ahead with the five goal lead. 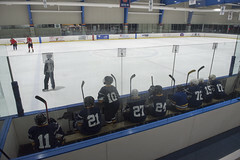 Penalties were a problem for both teams in the third period. The tension between both teams finally got the best of both teams around the 13 minute mark of the third. Nolan Yonkman of the Admirals knocked Binghamton’s Wacey Hamilton down to the ice. The Senators Mark Borowiecki, Matt Puempel, and Buddy Robinson paired off with Nolan Yonkman, Max Friberg, and Chris Wagner and had a good old fashioned line brawl. Puempel, and Max Friberg both received a game misconduct for their secondary altercations, in addition to their five minutes for fighting. Chris Wagner’s parents were in attendance for the night, but nothing to worry about as Chris handled himself quiet well. The Admirals finished off the period and held on to the 5-0 win over the Senators. Nathan Lawson faced 10 shots in relief of the Binghamton starter, Andrew Hammond. Frederik Andersen stood on top of his head stopping all of the Senators 32 shots. Norfolk 4 for 12 on the power play while the Senators could not convert on 6 power play opportunities. Alex Grant, finished with three goals and an assist and was the number one star, Anderson was number two, and Devante Smith-Pelly was the third star. Both teams combined for 120 penalty minutes on the night, with the majority of them coming in the final period. 1st Period-1, Norfolk, Smith-Pelly 2 5:44 (SH). 2, Norfolk, Grant 1 (Sarault, Andersen), 14:41 (PP). 3, Norfolk, Holland 1 (Wagner, Grant), 15:32 (PP). 4, Norfolk, Grant 2 (Sarault, Gagne), 18:27 (PP). 5, Norfolk, Grant 3 (Sarault, Gagne), 19:39 (PP). Penalties-Holland Nor (high-sticking), 4:22; Hamilton Bng (slashing), 9:56; Dziurzynski Bng (fighting), 13:03; Stortini Nor (instigating, fighting, misconduct), 13:03; Petersson Bng (tripping), 13:11; Zibanejad Bng (interference), 14:00; Borowiecki Bng (double minor – high-sticking), 14:41; Sdao Bng (closing hand on puck), 17:44; Dziurzynski Bng (slashing), 19:30. 2nd Period- No Scoring.Penalties-Holland Nor (holding), 1:00; served by Puempel Bng (bench minor – too many men), 8:39; Clark Nor (hooking), 8:39; Borowiecki Bng (roughing), 10:07; Sdao Bng (cross-checking), 11:05; Holland Nor (holding), 12:06; Clark Nor (interference), 16:28; Grant Bng (fighting), 19:54; Holland Nor (fighting), 19:54. 3rd Period- No Scoring.Penalties-Staubitz Nor (slashing), 10:59; Borowiecki Bng (fighting), 13:33; Hamilton Bng (hooking, fighting), 13:33; Puempel Bng (fighting, game misconduct – secondary altercation), 13:33; Friberg Nor (fighting, game misconduct – secondary altercation), 13:33; Wagner Nor (fighting), 13:33; Yonkman Nor (fighting), 13:33; Dziurzynski Bng (high-sticking), 14:09; Schneider Bng (roughing), 16:17. Shots on Goal-Binghamton 10-13-10-33. Norfolk 14-4-6-24. Power Play Opportunities-Binghamton 0 / 6; Norfolk 4 / 12. Goalies-Binghamton, Hammond 0-1-0 (14 shots-9 saves); Lawson 1-0-0 (10 shots-10 saves). Norfolk, Andersen 2-0-0 (33 shots-33 saves). Referees-Jon McIsaac (45), Keith Kaval (40). Linesmen-Mark Hamlett (81), Scott Pomento (25).